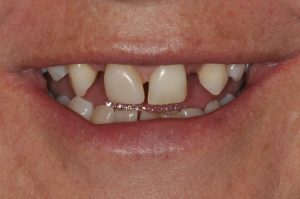 This lady had an unattractive smile due to congenitally missing teeth. The old denture kept breaking because the plastic was wearing down against the bottom teeth. 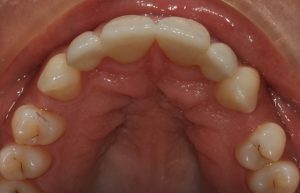 We discussed orthodontics and implants as an option but elected to try a faster, cheaper and simpler option with crowns on the front teeth and cantilever bridge pontics in the missing spaces. this allowed an immediate change, and she can still floss and clean these teeth well. 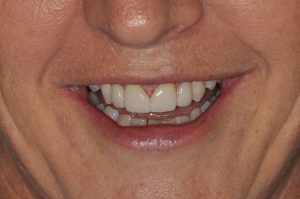 The eye teeth were left unharmed and a conservative approach has still led to a very attractive smile.